Neo-Confederate pamphlet on left. Loewen book on right. 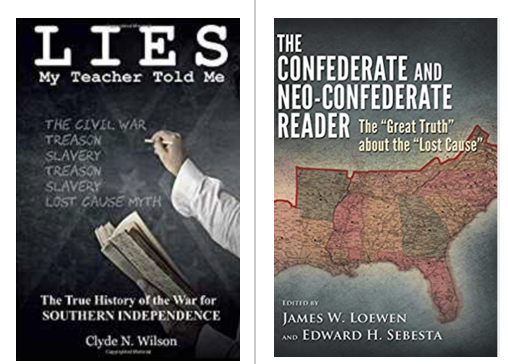 In 2016 I wrote here about Clyde Wilson’s scurrilous neo-Confederate pamphlet, “Lies My Teacher Told Me: The True History of the War for Southern Independence.” It is a 38-page pamphlet that mostly reprints an article he wrote for what is pretentiously titled the Abbeville Institute but actually amounts to another neo-Confederate’s house. Recently friends visited the Gettysburg Emporium, a Civil War re-enactors’ store in Gettysburg, where they saw copies for sale along with Confederate and Union uniforms and paraphernalia. Appalled at both the rip-off of my title and the content of the pamphlet, they told me about it. That spurred me to go to Amazon.com, where I read several glowing reviews of the work by other neo-Confederates. I decided to post my own not-so-glowing review. “He stole my book title and ignores the primary sources in The Confederate and Neo-Confederate Reader,” I wrote. “In order to believe this pamphlet, you must conclude that ALL the leaders of the Southern states, as they left the U.S., lied as to why. All explain that they are AGAINST states' rights and are leaving precisely because Northern states have tried to use states' rights to interfere with slavery. All explain that they are leaving in order to safeguard and expand slavery forever. “If in fact they are seceding for other reasons, why lie about it? We must infer, first, that they are NOT seceding for other reasons. But if you want to claim they ARE, then you have to concoct a theory of lying. Would it be that the leaders, unlike the audiences to which they appeal in their secession arguments, DO favor states' rights and ARE thinking about tariffs, but they know such causes would never convince rank-and-file white Southerners to fight? So they concoct slavery as the reason? If that is your argument, then it amounts to claiming white Southerners are so racist and pro-slavery that we have to lie to them! And I gave the pamphlet one star. ● “Your review should focus on specific features of the product and your experience with it. Feedback on the seller or your shipment experience should be provided at www.amazon.com/feedback. ● “We do not allow profane or obscene content. This applies to adult products too. ● “Advertisements, promotional material or repeated posts that make the same point excessively are considered spam. ● “Please do not include URLs external to Amazon or personally identifiable content in your review. ● “Any attempt to manipulate Community content or features, including contributing false, misleading, or inauthentic content, is strictly prohibited. Amazon also provided me with a link to a longer set of “don’ts.” Comments must not be libelous, defamatory, harassing, threatening, inflammatory, obscene, profane, pornographic, or lewd. Comments must not express hatred or intolerance for people on the basis of race, ethnicity, nationality, gender or gender identity, religion, sexual orientation, age, or disability. Don't post other people's phone numbers, email addresses, mailing addresses, or other personal information. Don't engage in name-calling or attack people. Well, readers at HNN can decide for themselves. Readers at Amazon cannot decide anything for themselves, because Amazon has kept them from seeing my comments.